Donating blood stem cells is, by law, voluntary and unpaid. You will, however, be reimbursed for reasonable expenses incurred should you be a match for a patient. You need to call The Sunflower Fund Toll Free Number 0800 12 10 82 (Monday – Thursday 08:30 – 16:30 and Friday 08:30 – 14:00) so that we can make sure that you meet the criteria, process your registration form and reference number and direct you to the closest Donor Recruitment Clinic. There you will give them the completed form and they will draw two test tubes of blood. 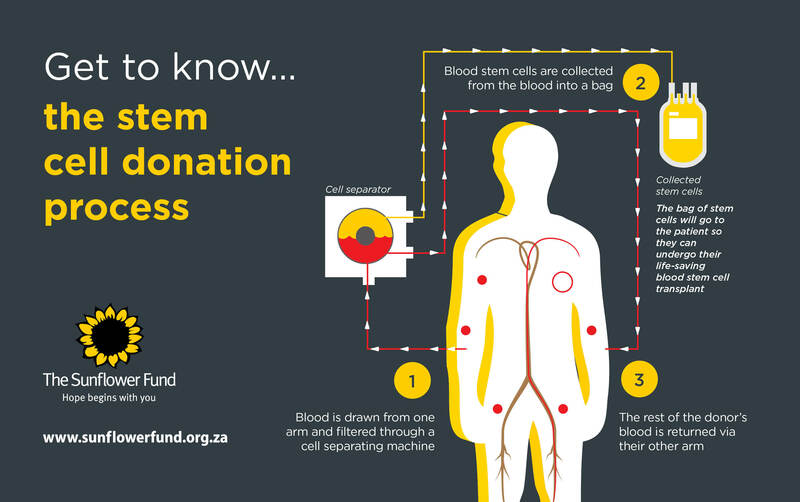 Your blood sample is then analysed (called “tissue typing”) and put on the Sunflower Fund’s stem cell registry, which is linked to a global database of potential blood stem cell donors. Donors will in due course be sent confirmation of their registration on The Sunflower Fund’s stem cell registry. You will remain on the registry until the age of 60 years or until you are a match for a patient. Donors will only be called back to donate stem cells if they are ever a perfect match for a patient. The odds of being a match are about 1: 100 000 which is why we need as many donors as possible. You will be contacted to confirm that you are still willing to donate stem cells. If you agree, you will have to undergo a medical examination to ensure you are still in good health to donate. Five days before the donation you will be given hormone injections to stimulate the production of stem cells in your bone marrow. You will then go into hospital for a relatively painless procedure that takes 4-6 hours.